Fans of Marvel’s interstellar band of misfits are in for a treat, as Marvel has officially announced in this year’s New York Comic Con that a Guardians of the Galaxy animated series is on the way and coming to Disney XD! Following the announcement, test footage was shown at NYCC ’14 and uploaded online by Marvel Entertainment online. The series follows after the events of the movie, and sees the team united as a group going on adventures, and will apparently feature Thanos somewhere down the line as well. In an animated test footage clip, Rocket Raccoon is being chased by a drone through an alien city, but is quick to retaliate and knock his pursuer down in true mercenary fashion. The footage ends with Star-Lord/ Peter Quill making an appearance and comment on Rocket’s choice of weaponry, and says that if they are going to hang out together, he’s going to need a bigger gun. The screen then shows the “Guardians of the Galaxy” sign, and then fades to black and the Marvel logos. As one of the most critically acclaimed movies of the Marvel Cinematic Universe, Guardians of the Galaxy set an unprecedented record by grossing as much as $654 million worldwide. Released in theaters on August 1st this year and directed by James Gunn, the film stars Chris Pratt as Peter Quill, a man who was abducted in the 1970’s as a child and raised by a space group of thieves and mercenaries known as the Ravagers to become a space smuggler. 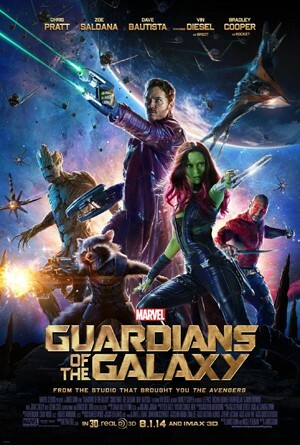 He soon finds himself paired with a band of aliens named Gamora, Drax the Destroyer, Rocket Raccoon, and Groot, and this unlikely group has to put their differences aside in order to save the universe from a big cosmic threat that could destroy reality and everything as they know it. They soon come to be known as the “Guardians of the Galaxy”, becoming the most dysfunctional team of heroes the universe has ever known. While no release date for the Guardians of the Galaxy series has been given, Marvel Animation is adding it to their “Phase 2” line-up of new shows coming up in their Disney XD block, which includes Ultimate Spider-Man: Web Warriors, Avengers Assemble, and Hulk and the Agents of S.M.A.S.H.